Taking a simultaneously imaginative and rigidly scientific view, chemical engineers and astronomers offer a template for life that could thrive in a harsh, cold world - specifically Titan, the giant moon of Saturn. A planetary body awash with seas not of water, but of liquid methane, Titan could harbor methane-based, oxygen-free cells. Their theorized cell membrane, composed of small organic nitrogen compounds and capable of functioning in liquid methane temperatures of 292 degrees below zero, is published inScience Advances, Feb. 27. The work is led by chemical molecular dynamics expert Paulette Clancy and first author James Stevenson, a graduate student in chemical engineering. The paper's co-author is Jonathan Lunine, director for Cornell's Center for Radiophysics and Space Research. Lunine is an expert on Saturn's moons and an interdisciplinary scientist on the Cassini-Huygens mission that discovered methane-ethane seas on Titan. Intrigued by the possibilities of methane-based life on Titan, and armed with a grant from the Templeton Foundation to study non-aqueous life, Lunine sought assistance about a year ago from Cornell faculty with expertise in chemical modeling. Clancy, who had never met Lunine, offered to help. "We're not biologists, and we're not astronomers, but we had the right tools," Clancy said. "Perhaps it helped, because we didn't come in with any preconceptions about what should be in a membrane and what shouldn't. We just worked with the compounds that we knew were there and asked, 'If this was your palette, what can you make out of that?'" On Earth, life is based on the phospholipid bilayer membrane, the strong, permeable, water-based vesicle that houses the organic matter of every cell. A vesicle made from such a membrane is called a liposome. Thus, many astronomers seek extraterrestrial life in what's called the circumstellar habitable zone, the narrow band around the sun in which liquid water can exist. But what if cells weren't based on water, but on methane, which has a much lower freezing point? The engineers named their theorized cell membrane an "azotosome," "azote" being the French word for nitrogen. "Liposome" comes from the Greek "lipos" and "soma" to mean "lipid body;" by analogy, "azotosome" means "nitrogen body." 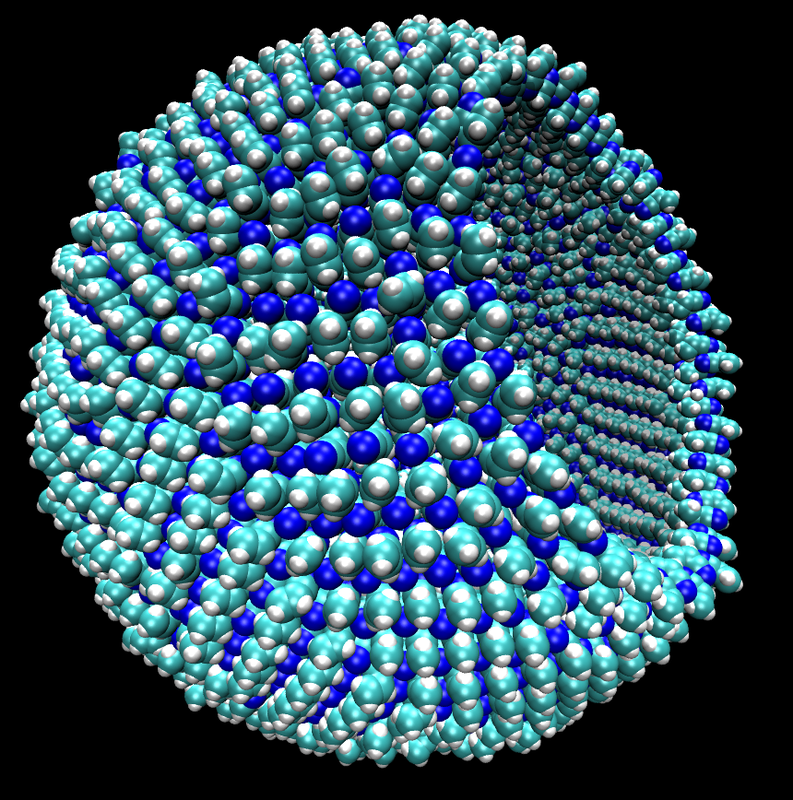 The azotosome is made from nitrogen, carbon and hydrogen molecules known to exist in the cryogenic seas of Titan, but shows the same stability and flexibility that Earth's analogous liposome does. This came as a surprise to chemists like Clancy and Stevenson, who had never thought about the mechanics of cell stability before; they usually study semiconductors, not cells. The engineers employed a molecular dynamics method that screened for candidate compounds from methane for self-assembly into membrane-like structures. The most promising compound they found is an acrylonitrile azotosome, which showed good stability, a strong barrier to decomposition, and a flexibility similar to that of phospholipid membranes on Earth. Acrylonitrile - a colorless, poisonous, liquid organic compound used in the manufacture of acrylic fibers, resins and thermoplastics - is present in Titan's atmosphere. Excited by the initial proof of concept, Clancy said the next step is to try and demonstrate how these cells would behave in the methane environment - what might be the analogue to reproduction and metabolism in oxygen-free, methane-based cells. Lunine looks forward to the long-term prospect of testing these ideas on Titan itself, as he put it, by "someday sending a probe to float on the seas of this amazing moon and directly sampling the organics." Stevenson said he was in part inspired by science fiction writer Isaac Asimov, who wrote about the concept of non-water-based life in a 1962 essay, "Not as We Know It." Said Stevenson: "Ours is the first concrete blueprint of life not as we know it." A team of researchers from Italy, Israel and the United Kingdom has succeeded in generating mature, functional skeletal muscles in mice using a new approach for tissue engineering. The scientists grew a leg muscle starting from engineered cells cultured in a dish to produce a graft. 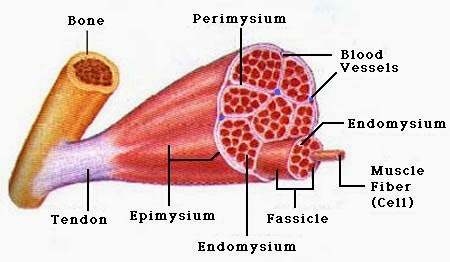 The subsequent graft was implanted close to a normal, contracting skeletal muscle where the new muscle was nurtured and grown. In time, the method could allow for patient-specific treatments for a large number of muscle disorders. The results are published in EMBO Molecular Medicine. This is an artist's impression of a quasar with a supermassive black hole in the distant universe. 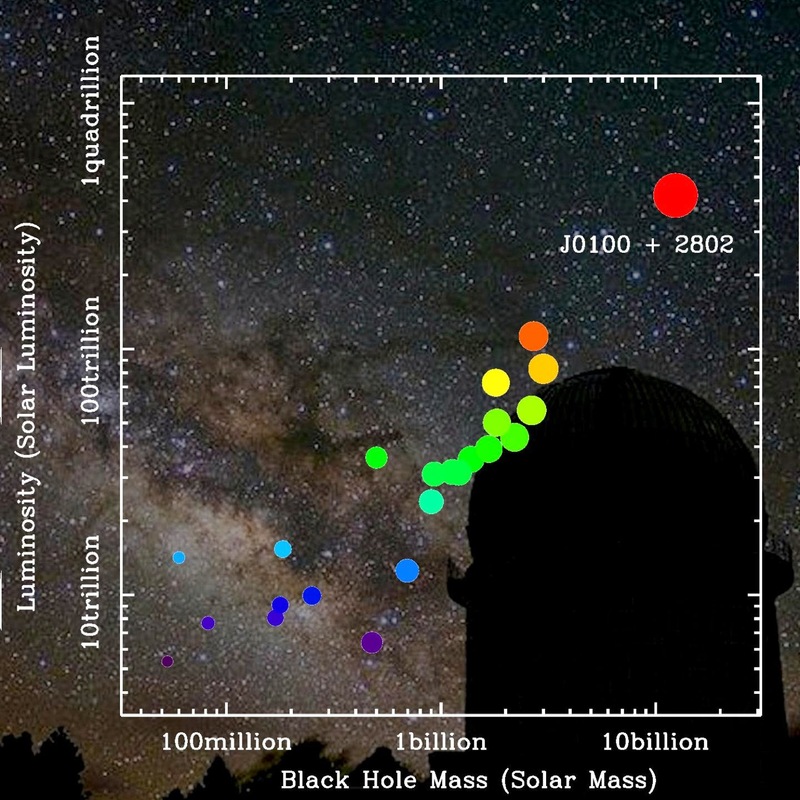 The newly discovered quasar SDSS J0100+2802 is the one with the most massive black hole and the highest luminosity among all known distant quasars. The background photo, provided by Yunnan Observatory, shows the dome of the 2.4meter telescope and the sky above it. It started with a trip to the basement of the American Museum of Natural History in New York to inspect preserved animal hides. Later, Georgia Institute of Technology researchers built a wind tunnel about 2 feet tall, complete with a makeshift eye. 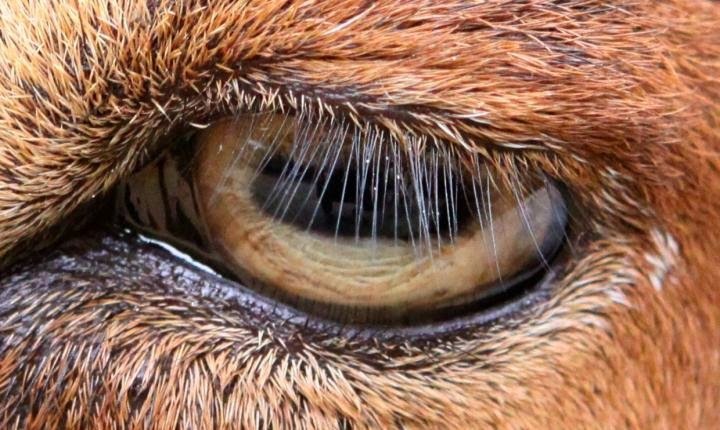 By putting both steps together, the team discovered that 22 species of mammals - from humans, to hedgehogs, to giraffes ¬- are the same: their eyelash length is one-third the width of their eye. Anything shorter or longer, including the fake eyelashes that are popular in Hollywood and make-up aisles, increases airflow around the eye and leads to more dust hitting the surface. 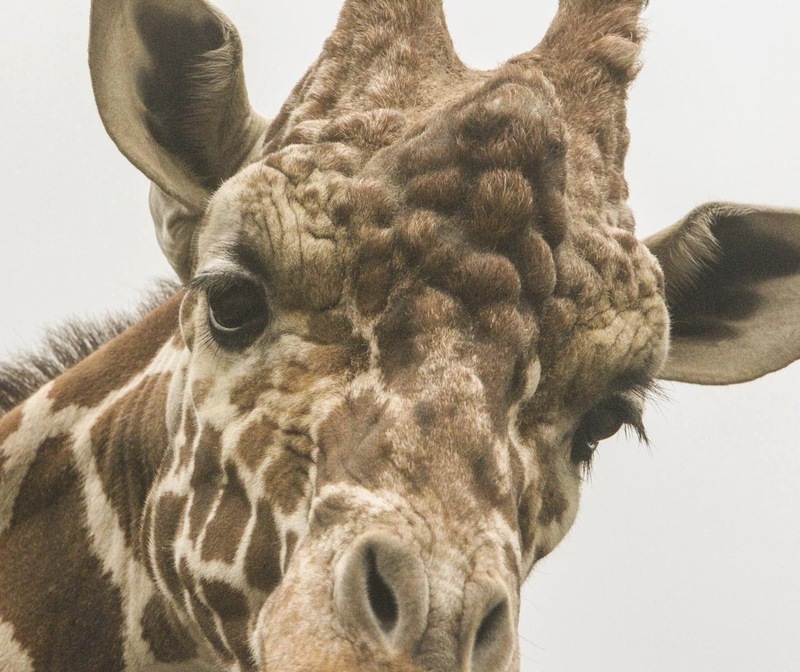 Giraffes and 21 other mammals, including humans, all eyelashes that are one third the width of their eye. "Eyelashes form a barrier to control airflow and the rate of evaporation on the surface of the cornea," said Guillermo Amador, a Georgia Tech Ph.D. candidate in the George W. Woodruff School of Mechanical Engineering who authored the study. "When eyelashes are shorter than the one-third ratio, they have only a slight effect on the flow. Their effect is more pronounced as they lengthen up until one-third. After that, they start funneling air and dust particles into the eye." The study is currently published in the Journal of the Royal Society Interface. Amador and the research team, which is led by Assistant Professor David Hu, sent a student to the museum in 2012 to measure eyes and eyelashes of various animals. Aside from an elephant, which has extremely long eyelashes, every species studied had evolved to the same ratio of lash length to eye width. These are the eye lashes of a goat. The team then built the wind tunnel to re-create air flows on a mimic of an adult, human eye. A 4-millimeter deep, 20-millimeter diameter aluminum dish served as the cornea. It sat on top of an acrylic plate, which imitated the rest of the face. Mesh surrounded the dish to replicate the eyelashes. "As short lashes grew longer, they reduced air flow, creating a layer of slow-moving air above the cornea," said Hu. "This kept the eye moist for a longer time and kept particles away. The majority of air essentially hit the eyelashes and rolled away from the eye." 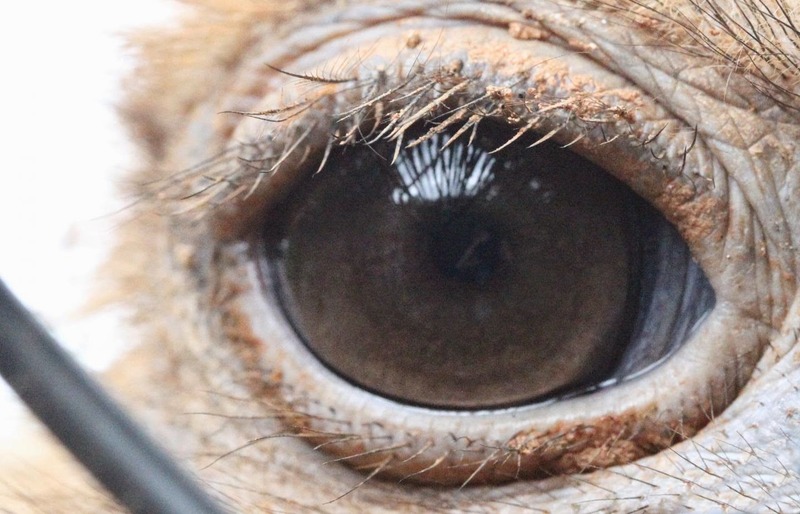 This image shows the eye and eyelashes of an ostrich. The opposite process occurred with longer eyelashes. The lashes extended further into the airflow and created a cylinder. The air and its molecules channeled toward the eye and led to faster evaporation. "This is why long, elegant, fake eyelashes aren't ideal," said Amador. "They may look good, but they're not the best thing for the health of your eyes." There are exceptions, though. The research team notes that people who can't grow eyelashes could wear fake ones, if they're the correct length, for extra protection and to reduce dry eye. "Even if they're not the correct length, more eyelashes are always better than less," said Alexander Alexeev, an associate professor in the School of Mechanical Engineering. "If fake eyelashes are dense enough, they may give the same overall effect in protecting the eye even if they are longer than one-third." Alexander Kusenko, a professor of physics and astronomy in the UCLA College, and colleagues propose that the matter-antimatter asymmetry could be related to the Higgs boson particle, which was the subject of prominent news coverage when it was discovered at Switzerland's Large Hadron Collider in 2012. If a particle and an antiparticle meet, they disappear by emitting two photons or a pair of some other particles. In the "primordial soup" that existed after the Big Bang, there were almost equal amounts of particles of antiparticles, except for a tiny asymmetry: one particle per 10 billion. As the universe cooled, the particles and antiparticles annihilated each other in equal numbers, and only a tiny number of particles remained; this tiny amount is all the stars and planets, and gas in today's universe, said Kusenko, who is also a senior scientist with the Kavli Institute for the Physics and Mathematics of the Universe. The 2012 discovery of the Higgs boson particle was hailed as one of the great scientific accomplishments of recent decades. The Higgs boson was first postulated some 50 years ago as a crucial element of the modern theory of the forces of nature, and is, physicists say, what gives everything in the universe mass. Physicists at the LHC measured the particle's mass and found its value to be peculiar; it is consistent with the possibility that the Higgs field in the first moments of the Big Bang was much larger than its "equilibrium value" observed today. The Higgs field "had to descend to the equilibrium, in a process of 'Higgs relaxation,'" said Kusenko, the lead author of the UCLA research. Two of Kusenko's graduate students, Louis Yang of UCLA and Lauren Pearce of the University of Minnesota, Minneapolis, were co-authors of the study. The research was supported by the U.S. Department of Energy (DE-SC0009937), the World Premier International Research Center Initiative in Japan and the National Science Foundation (PHYS-1066293). An unusual comet skimmed past the sun on Feb 18-21, 2015, as captured by the European Space Agency (ESA) and NASA's Solar and Heliospheric Observatory, or SOHO. This comet was interesting for two reasons. First it's what's called a non-group comet, meaning it's not part of any known family of comets. Most comets seen by SOHO belong to the Kreutz family - all of which broke off from a single giant comet many centuries ago. The second reason it's interesting is because the vast majority of comets that come close enough to the sun to be seen by SOHO do not survive the trip. Known as sungrazers, these comets usually evaporate in the intense sunlight. This comet made it to within 2.2 million miles of the sun's surface - but survived the trip intact. A description of sungrazer comets and where they come from. "There's a half-decent chance that ground observers might be able to detect it in the coming weeks," said Karl Battams, a solar scientist at the Naval Research Lab in Washington, D.C. "But it's also possible that events during its trip around the sun will cause it to die fairly fast." Since launching in 1995, SOHO has become the number one comet finder of all time -- this was comet discovery number 2,875. However, SOHO sees non-group comets like this only a few times a year. Quasars--supermassive black holes found at the center of distant massive galaxies--are the most-luminous beacons in the sky. These central supermassive black holes actively accrete the surrounding materials and release a huge amount of their gravitational energy. An international team of astronomers, including Carnegie's Yuri Beletsky, has discovered the brightest quasar ever found in the early universe, which is powered by the most massive black hole observed for an object from that time. Their work is published February 26 by Nature. This is an artist's rendering of a very distant, very ancient quasar, courtesy of the European Southern Observatory. The quasar was found at a redshift of z=6.30. This is a measurement of how much the wavelength of light emitted from it that reaches us on Earth is stretched by the expansion of the universe. As such, it can be used to calculate the quasar's age and distance from our planet. A higher redshift means larger distance and hence looking further back in time. "This quasar is very unique. 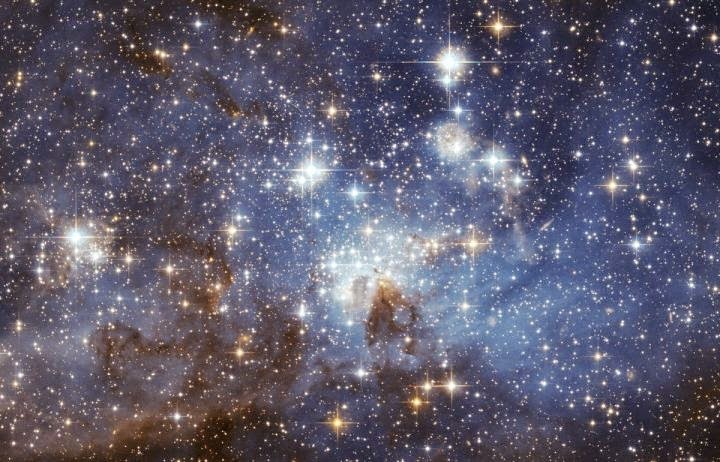 Just like the brightest lighthouse in the distant universe, its glowing light will help us to probe more about the early universe," said team-leader Xue-Bing Wu of Peking University and the Kavli Institute of Astronomy and Astrophysics. 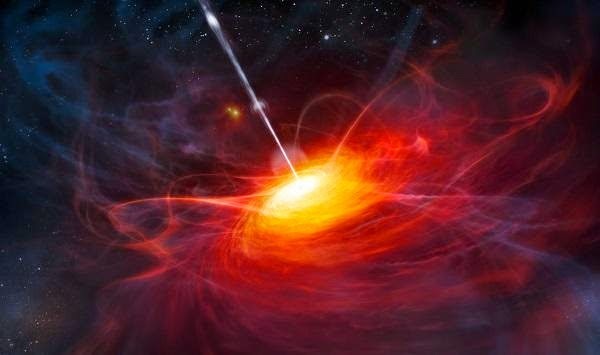 With a luminosity of 420 trillion that of our own Sun's, this new quasar is seven times brighter than the most distant quasar known (which is 13 billion years away). 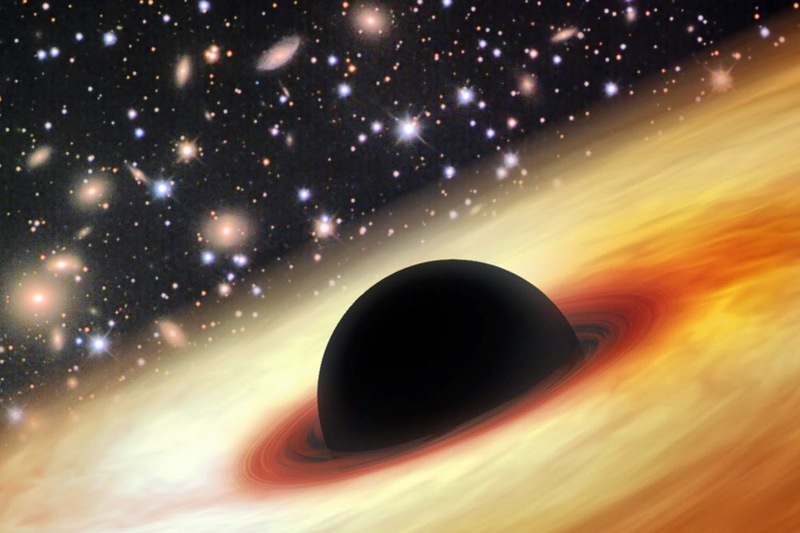 It harbors a black hole with mass of 12 billion solar masses, proving it to be the most luminous quasar with the most massive black hole among all the known high redshift quasars. The team developed a method of detecting quasars at redshifts of 5 and higher. These detections were verified by the 6.5-meter Multiple Mirror Telescope (MMT) and 8.4m Large Binocular Telescope (LBT) in Arizona; the 6.5m Magellan Telescope at Carnegie's Las Campanas Observatory in Chile; and the 8.2m Gemini North Telescope in Hawaii. "This quasar is a unique laboratory to study the way that a quasar's black hole and host galaxy co-evolve," Beletsky said. "Our findings indicate that in the early Universe, quasar black holes probably grew faster than their host galaxies, although more research is needed to confirm this idea." The Sahara Desert is a near-uninterrupted brown band of sand and scrub across the northern third of Africa. The Amazon rain forest is a dense green mass of humid jungle that covers northeast South America. But after strong winds sweep across the Sahara, a tan cloud rises in the air, stretches between the continents, and ties together the desert and the jungle. It’s dust. And lots of it. The lidar instrument aboard the CALIPSO satellite sends out pulses of light that bounce off particles in the atmosphere and back to the satellite. It distinguishes dust from other particles based on optical properties. For the first time, a NASA satellite has quantified in three dimensions how much dust makes this trans-Atlantic journey. Scientists have not only measured the volume of dust, they have also calculated how much phosphorus – remnant in Saharan sands from part of the desert’s past as a lake bed – gets carried across the ocean from one of the planet’s most desolate places to one of its most fertile. For the first time, a NASA satellite has quantified in three dimensions how much dust makes the trans-Atlantic journey from the Sahara Desert the Amazon rain forest. Among this dust is phosphorus, an essential nutrient that acts like a fertilizer, which the Amazon depends on in order to flourish. A new paper published Feb. 24 in Geophysical Research Letters, a journal of the American Geophysical Union, provides the first satellite-based estimate of this phosphorus transport over multiple years, said lead author Hongbin Yu, an atmospheric scientist at the University of Maryland who works at NASA's Goddard Space Flight Center in Greenbelt, Maryland. A paper published online by Yu and colleagues Jan. 8 in Remote Sensing of the Environment provided the first multi-year satellite estimate of overall dust transport from the Sahara to the Amazon. This trans-continental journey of dust is important because of what is in the dust, Yu said. Specifically the dust picked up from the Bodélé Depression in Chad, ann ancient lake bed where rock minerals composed of dead microorganisms are loaded with phosphorus. Phosphorus is an essential nutrient for plant proteins and growth, which the Amazon rain forest depends on n order to flourish. The phosphorus that reaches Amazon soils from Saharan dust, an estimated 22,000 tons per year, is about the same amount as that lost from rain and flooding, Yu said. The finding is part of a bigger research effort to understand the role of dust and aerosols in the environment and on local and global climate. "We know that dust is very important in many ways. It is an essential component of the Earth system. Dust will affect climate and, at the same time, climate change will affect dust," said Yu. To understand what those effects may be, "First we have to try to answer two basic questions. How much dust is transported? And what is the relationship between the amount of dust transport and climate indicators?" The data show that wind and weather pick up on average 182 million tons of dust each year and carry it past the western edge of the Sahara at longitude 15W. This volume is the equivalent of 689,290 semi trucks filled with dust. The dust then travels 1,600 miles across the Atlantic Ocean, though some drops to the surface or is flushed from the sky by rain. Near the eastern coast of South America, at longitude 35W, 132 million tons remain in the air, and 27.7 million tons – enough to fill 104,908 semi trucks – fall to the surface over the Amazon basin. About 43 million tons of dust travel farther to settle out over the Caribbean Sea, past longitude 75W. 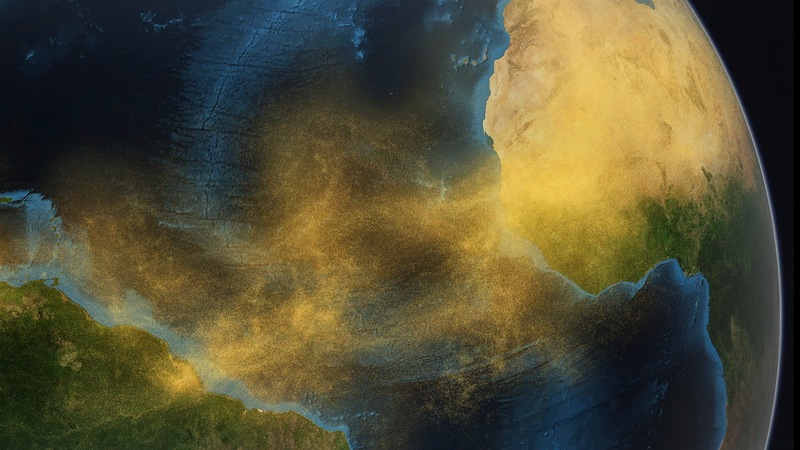 Yu and colleagues focused on the Saharan dust transport across the Atlantic Ocean to South America and then beyond to the Caribbean Sea because it is the largest transport of dust on the planet. The seven-year data record, while too short for looking at long-term trends, is nevertheless very important for understanding how dust and other aerosols behave as they move across the ocean, said Chip Trepte, project scientist for CALIPSO at NASA's Langley Research Center in Virginia, who was not involved in either study. "We need a record of measurements to understand whether or not there is a fairly robust, fairly consistent pattern to this aerosol transport," he said. Why so much variation? Scientists believe it has to do with the conditions in the Sahel, the long strip of semi-arid land on the southern border of the Sahara. After comparing the changes in dust transport to a variety of climate factors, the one Yu and his colleagues found a correlation to was the previous year's Sahel rainfall. When Sahel rainfall increased, the next year's dust transport was lower. 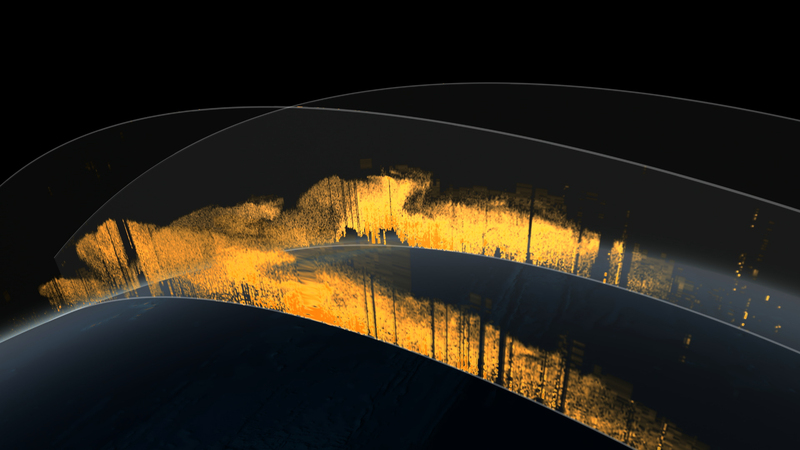 CALIPSO collects "curtains" of data that show valuable information about the altitude of dust layers in the atmosphere. Knowing the height at which dust travels is important for understanding, and eventually using computers to model, where that dust will go and how the dust will interact with Earth's heat balance and clouds, now and in future climate scenarios. "Wind currents are different at different altitudes," said Trepte. "This is a step forward in providing the understanding of what dust transport looks like in three dimensions, and then comparing with these models that are being used for climate studies." "This is a small world," Yu said, "and we're all connected together." Scientists use electrical stimulus of frontal lobes triggers spontaneous 'mind wandering' -- alongside improved task performance. Scientists at Bar-Ilan University are the first to demonstrate how an external stimulus of low-level electricity can literally change the way we think, producing a measurable up-tick in the rate at which daydreams - or spontaneous, self-directed thoughts and associations - occur. Along the way, they made another surprising discovery: that while daydreams offer a welcome "mental escape" from boring tasks, they also have a positive, simultaneous effect on task performance. The new study was carried out in Bar-Ilan's Cognitive Neuroscience Laboratory supervised by Prof. Moshe Bar, part of the University's Gonda (Goldschmied) Multidisciplinary Brain Research Center which Prof. Bar also directs. While a far cry from the diabolical manipulation of dream content envisioned in "Inception" - the science-fiction thriller starring Leonardo DiCaprio - the Bar-Ilan University study is the first to prove that a generic external stimulus, unrelated to sensory perception, triggers a specific type of cognitive activity. In the experiment - designed and executed by Prof. Bar's post-doctoral researcher Dr. Vadim Axelrod - participants were treated with transcranial direct current stimulation (tDCS), a non-invasive and painless procedure that uses low-level electricity to stimulate specific brain regions. During treatment, the participants were asked to track and respond to numerals flashed on a computer screen. They were also periodically asked to respond to an on-screen "thought probe" in which they reported - on a scale of one to four - the extent to which they were experiencing spontaneous thoughts unrelated to the numeric task they had been given. According to Prof. Bar - a long-time faculty member at Harvard Medical School who has authored several studies exploring the link between associative thinking, memory and predictive ability - the specific brain area targeted for stimulation in this study was anything but random. "We focused tDCS stimulation on the frontal lobes because this brain region has been previously implicated in mind wandering, and also because is a central locus of the executive control network that allows us to organize and plan for the future," Bar explains, adding that he suspeced that there might be a connection between the two. As a point of comparison and in separate experiments, the researchers used tDCS to stimulate the occipital cortex - the visual processing center in the back of the brain. They also conducted control studies where no tDCS was used. While the self-reported incidence of mind wandering was unchanged in the case of occipital and sham stimulation, it rose considerably when this stimulation was applied to the frontal lobes. "Our results go beyond what was achieved in earlier, fMRI-based studies," Bar states. "They demonstrate that the frontal lobes play a causal role in the production of mind wandering behavior." In an unanticipated finding, the present study demonstrated how the increased mind wandering behavior produced by external stimulation not only does not harm subjects' ability to succeed at an appointed task, it actually helps. Bar believes that this surprising result might stem from the convergence, within a single brain region, of both the "thought controlling" mechanisms of executive function and the "thought freeing" activity of spontaneous, self-directed daydreams. "Over the last 15 or 20 years, scientists have shown that - unlike the localized neural activity associated with specific tasks - mind wandering involves the activation of a gigantic default network involving many parts of the brain," Bar says. "This cross-brain involvement may be involved in behavioral outcomes such as creativity and mood, and may also contribute to the ability to stay successfully on-task while the mind goes off on its merry mental way." "Interestingly, while our study's external stimulation increased the incidence of mind wandering, rather than reducing the subjects' ability to complete the task, it caused task performance to become slightly improved. The external stimulation actually enhanced the subjects' cognitive capacity." In the meantime, Bar's team at the Bar-Ilan University Lab for Cognitive Neuroscience is pleased to note that in their work on mind wandering - probably the most omnipresent internal cognitive function - they have made the human brain just a little less mysterious. The research described above was funded, in part, by the Israeli Center of Research Excellence in Cognition (ICORE). Oxytocin, sometimes referred to as the 'love' or 'cuddle' hormone, has a legendary status in popular culture due to its vital role in social and sexual behaviour and long-term bonding. Now researchers from the University of Sydney and the University of Regensburg have discovered it also has a remarkable influence on the intoxicating effect of alcohol, which they report in the scientific journal Proceedings of the National Academy of Sciences on 24 February. Dr Michael Bowen, School of Psychology, University of Sydney is lead author on a PNAS paper showing oxytocin counteracts the intoxicating effect of alcohol in rats. When the researchers infused oxytocin into the brains of rats which were then given alcohol it prevented the drunken lack of coordination caused by the alcohol. "In the rat equivalent of a sobriety test, the rats given alcohol and oxytocin passed with flying colours, while those given alcohol without oxytocin were seriously impaired," Dr Bowen said. The researchers demonstrated that oxytocin prevents alcohol from accessing specific sites in the brain that cause alcohol's intoxicating effects, sites known as delta-subunit GABA-A receptors. "Alcohol impairs your coordination by inhibiting the activity of brain regions that provide fine motor control. Oxytocin prevents this effect to the point where we can't tell from their behaviour that the rats are actually drunk. It's a truly remarkable effect," Dr Bowen said. This 'sobering-up' effect of oxytocin has yet to be shown in humans but the researchers plan to conduct these studies in the near future. "The first step will be to ensure we have a method of drug delivery for humans that allows sufficient amounts of oxytocin to reach the brain. If we can do that, we suspect that oxytocin could also leave speech and cognition much less impaired after relatively high levels of alcohol consumption," Dr Bowen said. It's worth noting that oxytocin can't save you from being arrested while driving home from the pub. "While oxytocin might reduce your level of intoxication, it won't actually change your blood alcohol level," Dr Bowen said. "This is because the oxytocin is preventing the alcohol from accessing the sites in the brain that make you intoxicated, it is not causing the alcohol to leave your system any faster". Some people might worry a drug which decreases your level of intoxication could encourage you to drink more. As it turns out, separate experiments conducted by the researchers and other groups have shown that taking oxytocin actually reduces alcohol consumption and craving in both rats and humans. "We believe that the effects of oxytocin on alcohol consumption and craving act through a similar mechanism in the brain to the one identified in our research," said Dr Bowen. Their findings could see the development of new oxytocin-based treatments for alcohol-use disorders that target this mechanism. Coastal communities in 15 states that depend on the $1 billion shelled mollusk industry (primarily oysters and clams) are at long-term economic risk from the increasing threat of ocean acidification, a new report concludes. Oysters at hatcheries in Oregon and Washington are showing the effects of ocean acidification. 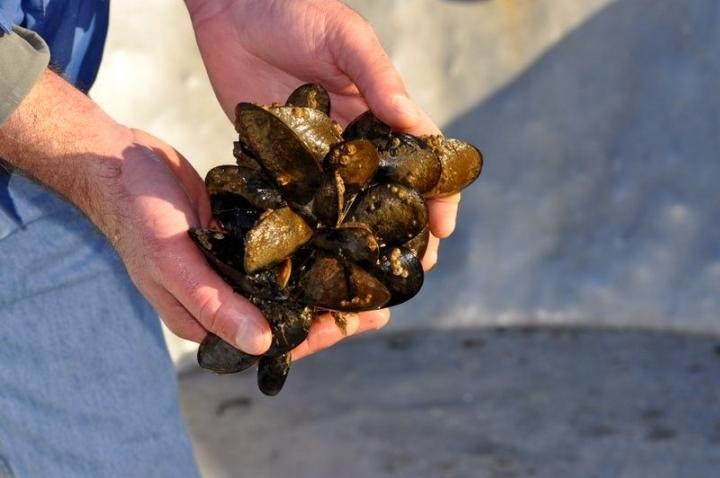 "This clearly illustrates the vulnerability of communities dependent on shellfish to ocean acidification," said Waldbusser, a researcher in OSU's College of Earth, Ocean, and Atmospheric Sciences and co-author on the paper. "We are still finding ways to increase the adaptive capacity of these communities and industries to cope, and refining our understanding of various species' specific responses to acidification. Aston University (UK) researchers have said that 'walking football' could have a multitude of health benefits. The new sporting craze of ‘Walking Football’ may enable people to continue playing football into their 60s and 70s while reaping a multitude of health benefits, according to Aston University researchers. The sport was created in 2011 to help keep older players involved in football for longer and from hanging up their boots before they need to. Games are played at a slower pace to reduce the threat of pain, discomfort and injury, with players briskly walking through matches. Across the country, new Walking Football clubs and groups are setting up every week as its popularity rockets. Although it is known that regular football, including 11-a-side and 5-a-side versions of the sport, has considerable health benefits such as reducing the risk of cardiovascular disease and improving blood pressure, little research has been done into the impact of Walking Football. Aston University researcher, Peter Reddy, felt compelled to conduct a study into the sport to discover just how healthy it is. The investigation will assess two groups of men and women over the age of 48 playing Walking Football once a week for 12 weeks. Participants will be regularly assessed to measure changes in their postural balance, blood pressure and resting heart rate, cholesterol, blood sugar and bone density – all indicators of general good health. Peter, a Reader in Psychology, said: “Football is a fantastically good way of staying fit and healthy. Studies have shown it can be effective in the treatment of mild to moderate hypertension and that it can produce high aerobic activity with marked improvements in fat oxidation and aerobic power. Most people who play the sport, at amateur and professional levels, give it up in their late 30s but there’s no reason not to enjoy the beautiful game until well into your 60s and even 70s. In the context of an ageing society, rising levels of obesity and the growing incident of late onset diabetes, it is thought Walking Football has the potential to make a significant impact. 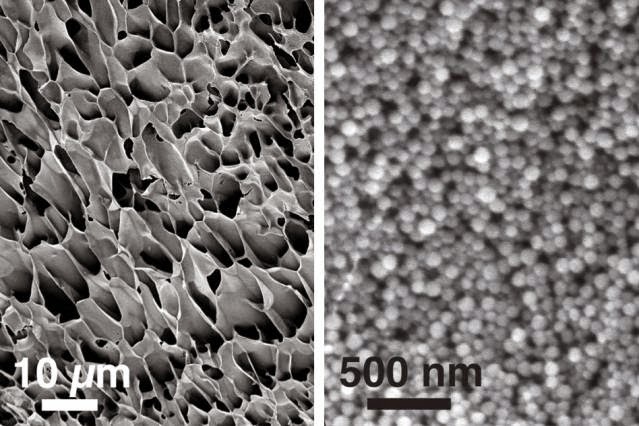 A self-healing nano gel developed by MIT researchers can be injected into the body and act as a long-term drug depot. Neurons hum at different frequencies to tell the brain which memories it should store. 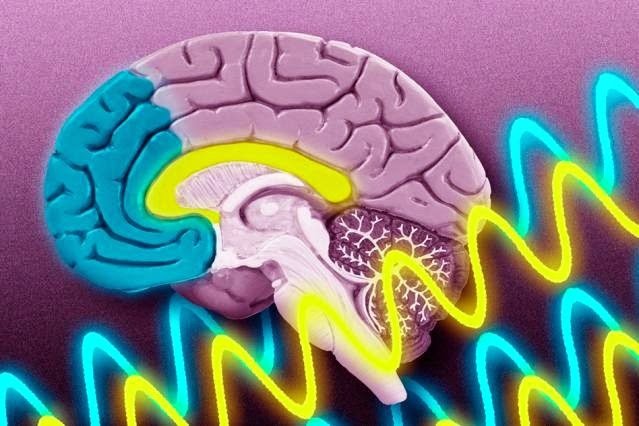 Two areas of the brain — the hippocampus (yellow) and the prefrontal cortex (blue) — use two different brain-wave frequencies to communicate as the brain learns to associate unrelated objects. A new study from MIT neuroscientists adds to that evidence. The researchers found that two brain regions that are key to learning — the hippocampus and the prefrontal cortex — use two different brain-wave frequencies to communicate as the brain learns to associate unrelated objects. Whenever the brain correctly links the objects, the waves oscillate at a higher frequency, called “beta,” and when the guess is incorrect, the waves oscillate at a lower “theta” frequency. “It’s like you’re playing a computer game and you get a ding when you get it right, and a buzz when you get it wrong. These two areas of the brain are playing two different ‘notes’ for correct guesses and wrong guesses,” says Earl Miller, the Picower Professor of Neuroscience, a member of MIT’s Picower Institute for Learning and Memory, and senior author of a paper describing the findings in the Feb. 23 online edition of Nature Neuroscience. The research was funded by the National Institute of Mental Health and the Picower Foundation. 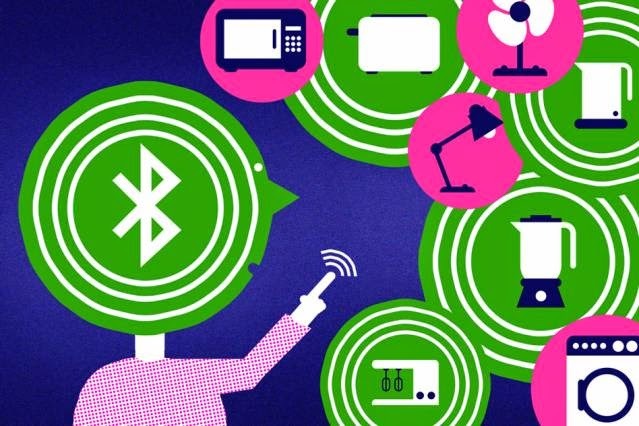 A circuit developed at MIT that reduces power leakage when transmitters are idle could greatly extend battery life. Climate scientists now put the odds that the American Southwest is headed into a 30-year "mega drought" at 50/50. Meanwhile, the forecast for the Pacific Northwest is continued warming with slightly drier summers and even wetter winters. However, 21,000 years ago, at the peak of the last Ice Age, a period known as the Last Glacial Maximum, the Southwest was wetter than it is today - much wetter - and the Northwest was drier - much drier. 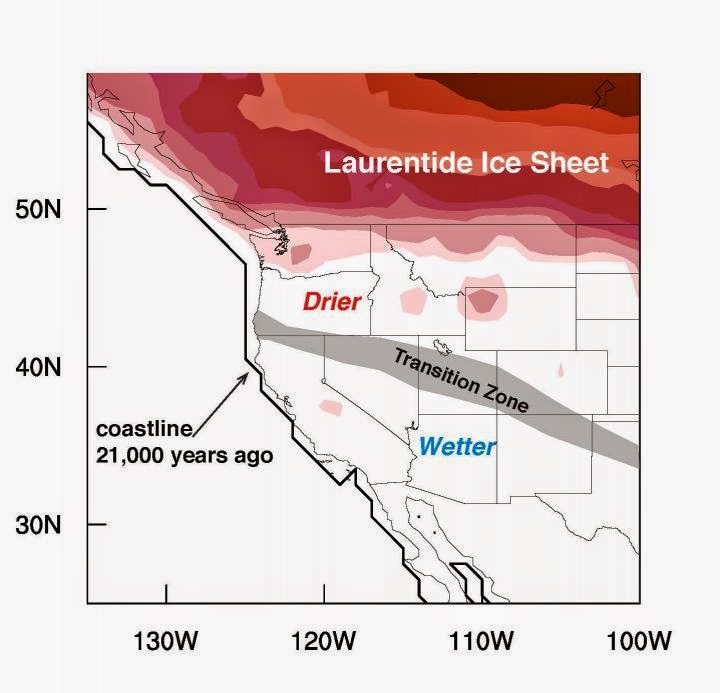 Reconstruction of the climate 21,000 years ago at the peak of the last ice age in the western US found that the transition between the dryer zone in the north and wetter zone in the south ran diagonally from the northwest to southeast. A team of scientists from Vanderbilt and Stanford universities have created the first comprehensive map of the topsy-turvy climate of the period and are using it to test and improve the global climate models that have been developed to predict how precipitation patterns will change in the future. Their efforts are described in a paper published online on Feb. 23 by the journalNature Geoscience. "Most of the previous research of the past climate in this region is based on detailed studies of specific sites," said the lead author Jessica Oster, assistant professor of earth and environmental sciences at Vanderbilt University. "We combined these records to create a detailed map of past climate change in the American West. We then compared this map to computer climate models to understand what caused these changes." "Our previous research used field studies to understand the history of climate change in the Western US," said study coauthor Kate Maher, assistant professor of geological and environmental sciences at Stanford University. " It was amazing to see how our results, when combined with work of many other research groups and compared to the newest generation of climate models, revealed a consistent story about how rainfall patterns were altered in the past." "This is a transition zone. There are strong competing effects such as changes in the large-scale atmospheric circulation, sea surface temperature changes like El Niño and La Niña and the dynamics of westerly storm tracks that all interact at the mid-latitudes," said Stanford co-author Matthew Winnick who contributed to the study with fellow doctoral student Daniel Ibarra. "As a result, understanding the exact nature of how these different effects express themselves to form the north/south transition zone will be extremely important for freshwater resource management in major population centers across the Western US." "People hypothesized that the transition between the two climate zones ran along a straight east-west line, but that didn't work very well," said Oster. "Our study indicates that the transition zone is angled from the northwest to the southeast." This explains the drier conditions in Utah and Colorado. Their analysis also found that the wetter sites in the north were situated next to large inland lakes that existed at the time, so they attribute them to local, lake effects. One is that the cold air above the Laurentide Ice Sheet created a tremendous high pressure system that shifted the polar jet stream to the south, pushing the track followed by winter storms down into the Southwest, which had the effect of dramatically reducing the amount of rainfall in the Northwest while increasing it in the Southwest. An alternative explanation is that the subtropical jet stream was enhanced, increasing the frequency with which the Southwest was hit by "Pineapple Expresses:" water-saturated subtropical plumes of air that periodically swing up from Hawaii and hit the West Coast and these days cause serious flooding. When combined with a strengthened summer monsoon, this could also explain the wetter conditions in the Southwest. When the researchers compared their results with the output of a number of climate models, they found that several of the newer models that have higher resolution and use updated ice sheet configurations do "a very good job" of reproducing the patterns observed in the proxy records. "According to these models, it is the high pressure cells that are really important in steering winter storms, and in determining the shape and location of the transition zone," said Oster. "Some models do hint at an increase in subtropical winter moisture, but we don't see evidence of an enhanced summer monsoon." Given the prospect of continued global warming, there is no chance that this ancient weather pattern will return in foreseeable future. Curiously, however, a similar pattern re-emerges periodically during the warm phase of the El Nino-Southern Oscillation, which produces drier than normal winters in the Northwest and wetter than normal winters in the Southwest. A sauna is a small room or building designed as a place to experience dry or wet heat sessions, or an establishment with one or more of these and auxiliary facilities. The steam and high heat make the bathers perspire. 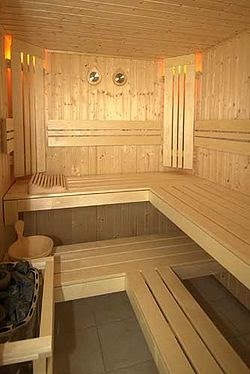 Saunas can be divided into two basic styles: conventional saunas that warm the air or infrared saunas that warm objects. University of Tokyo researchers have developed a "fever alarm armband," a flexible, self-powered wearable device that sounds an alarm in case of high body temperature. The armband is 30 cm long and 18 cm wide, and can be worn either directly on the skin or on top of clothing. The device is designed so that the thermal sensor is located between the arm and the body. The organic power supply circuit is located under the piezo film speaker to reduce surface area. This armband will be presented at the 2015 IEEE International Solid State Circuits Conference, San Francisco, on 22-26 February, 2015. The flexible organic components developed for this device are well-suited to wearable devices that continuously monitor vital signs including temperature and heart rate for applications in healthcare settings. Bacteria are masters in adapting to their environment. This adaptability contributes to the bacteria's survival inside their host. Researchers at the Vetmeduni Vienna now demonstrated that the bacterial pathogen Listeria monocytogenes adapts its metabolism specifically to the host genotype. The bacterial metabolic fingerprint correlated with the susceptibility of the infected mouse strain. The researchers published their results in the journal PLOS ONE. This image shows bacteria on a plate and the respective FTIR spectrum in front. Monika Ehling-Schulz's group from the Institute of Microbiology, together with Mathias Müller's group at the Institute of Animal Breeding and Genetics studied the influence of host organisms on bacterial metabolism. The researchers infected three different lineages of mice with the bacteria Listeria monocytogenes. The mouse strains showed significant differences in their response to the infection and in the severity of the clinical symptoms. The researchers isolated the bacteria days after infection and analysed them for changes in their metabolism. They used a specific infrared spectroscopy method (FTIR) to monitor metabolic changes. The chemometric analysis of the bacterial metabolic fingerprints revealed host genotype specific imprints and adaptations of the bacterial pathogen. "Our findings may have implications on how to treat infectious diseases in general. Every patient is different and so are their bacteria", first author Tom Grunert states. After isolation from the mice, all bacteria were cultured under laboratory conditions. After prolonged cultivation under laboratory conditions all three bacterial batches switched back to the same metabolic fingerprint. "Based on our results it can be assumed that bacteria have some sort of memory. It takes some time under host-free laboratory conditions for this 'memory effect' to vanish," explains the head of the Institute, Monika Ehling-Schulz. 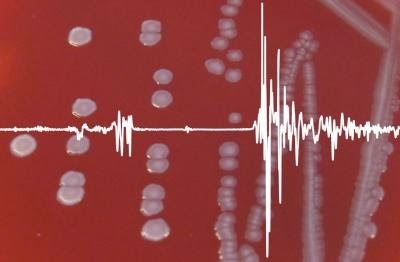 The researchers employed a technique known as Fourier-transform infrared (FTIR) spectroscopy to monitor the metabolism in the bacteria. An infrared beam directed through the bacteria causes molecules such as proteins, polysaccharides and fatty acids to vibrate. The molecules variably allow more or less light to pass. The different molecular composition in the bacteria yields different spectral data providing information about the molecules inside. "This method is used especially in microbiological diagnostics to identify bacteria. But we refined the method to decipher and monitor differences in the metabolic fingerprint of the same bacteria," says Grunert. In the future, the researchers want to extend the concept to other species of bacteria and further study the impact of host organisms on pathogens. In a next step, the team plans to find out what exactly it is, that leads to metabolic changes in bacteria. The findings appear Feb. 23 online in the journal Environmental Health Perspectives. A PDF is available on request. The researchers measured arsenic in home tap water, urine from 72 six-week-old infants and breast milk from nine women in New Hampshire. 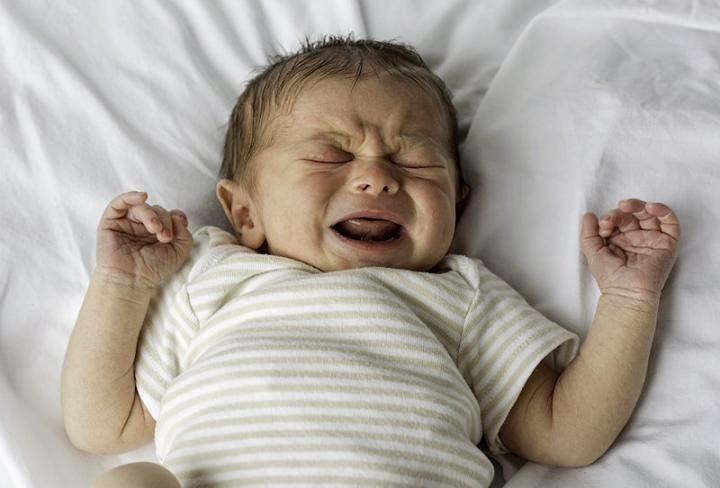 Urinary arsenic was 7.5 times lower for breast-fed than formula-fed infants. The highest tap water arsenic concentrations far exceeded the arsenic concentrations in powdered formulas, but for the majority of the study's participants, both the powder and water contributed to exposure. "This study's results highlight that breastfeeding can reduce arsenic exposure even at the relatively low levels of arsenic typically experienced in the United States," says lead author Professor Kathryn Cottingham. "This is an important public health benefit of breastfeeding." Arsenic occurs naturally in bedrock and is a common global contaminant of well water. It causes cancers and other diseases, and early-life exposure has been associated with increased fetal mortality, decreased birth weight and diminished cognitive function. The Environmental Protection Agency has set a maximum contaminant level for public drinking water, but private well water is not subject to regulation and is the primary water source in many rural parts of the United States. "We advise families with private wells to have their tap water tested for arsenic," says senior author Professor Margaret Karagas, principal investigator at Dartmouth's Children's Environmental Health and Disease Prevention Research Center. Added study co-lead author Courtney Carignan: "We predict that population-wide arsenic exposure will increase during the second part of the first year of life as the prevalence of formula-feeding increases."